Sponsored by www.welttierschutz,org. 146 Sterilisation in 3 days ...as well as 550 Rabies vaccinations. Among stressors of riots and burnt down infrastructure and trashed "theater", days before the project was due to kick off, the community pulled together and delivered a great project. 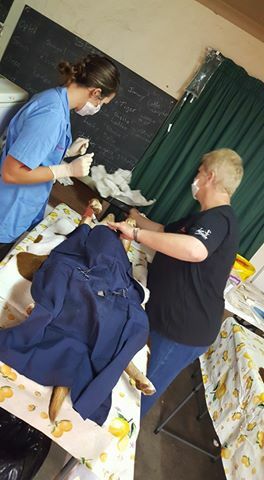 Well done to our Vet, Dr Renee Van Rheede Van Oudtshoorn, AWA's Cherie Ziervogel,Jen en Ets Putter, Student Jade Hilton and all the assistance from Kuruman Animal Welfare and their supporters as well as State Veterinary Services for lending hands to help vaccinate.